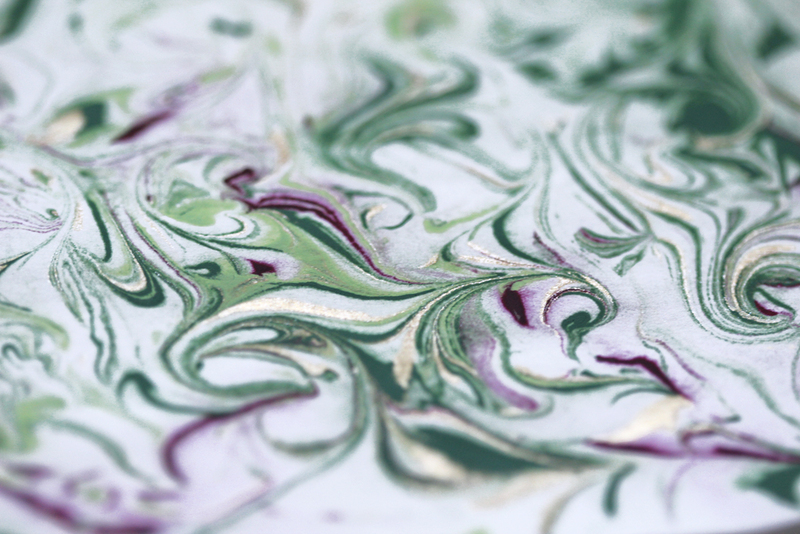 I’ve done paper marbling many times, occasionally with satisfying results. Unfortunately, it required a checklist of fussy materials, as well as a sizable chunk of time. Something called ‘size’ had to be mixed ahead of time and allowed to thicken, but not so far ahead of time that it got moldy. Paper had to be pre-treated with mordant and allowed to dry. Who has time for all of that? I also noticed that I was getting a little precious about the supplies–i.e., I had a hard time sharing them with my kids. That’s because up until a week or so ago, I thought the only way to marbleize was to buy the kit off Amazon, or drive around town trying to find ingredients like alum and methyl cellulose. Full disclosure here: those are the materials and methods you need to use if you want those amazingly delicate Martha Stewart-y results. If you want to create papers that precisely resemble the endpapers found in old leather-bound books, and if time is not an issue, then by all means go and do it that way. 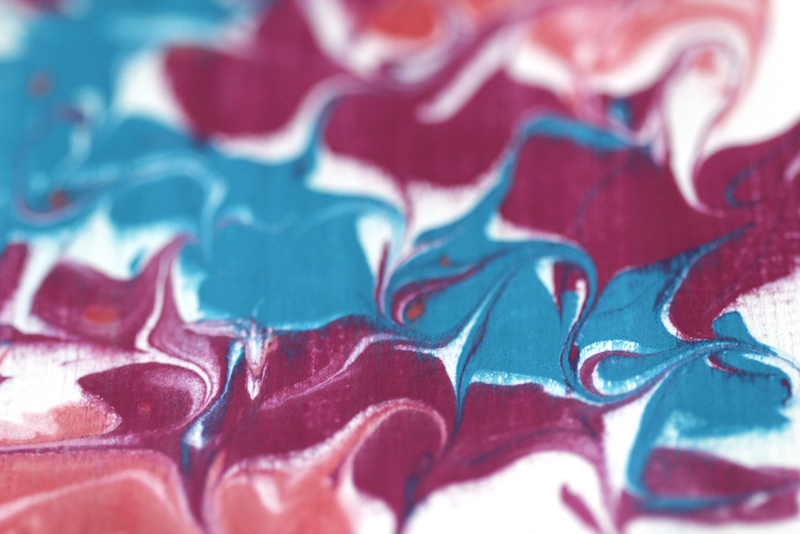 Marbling is fun. And cool. Why not try it with cheaper, more easily accessible supplies? That way, you might be more likely to do it with a group of kids, or with your own, on some random rainy day when you are desperate to squelch the endless bickering. Not that my kids ever behave that way. 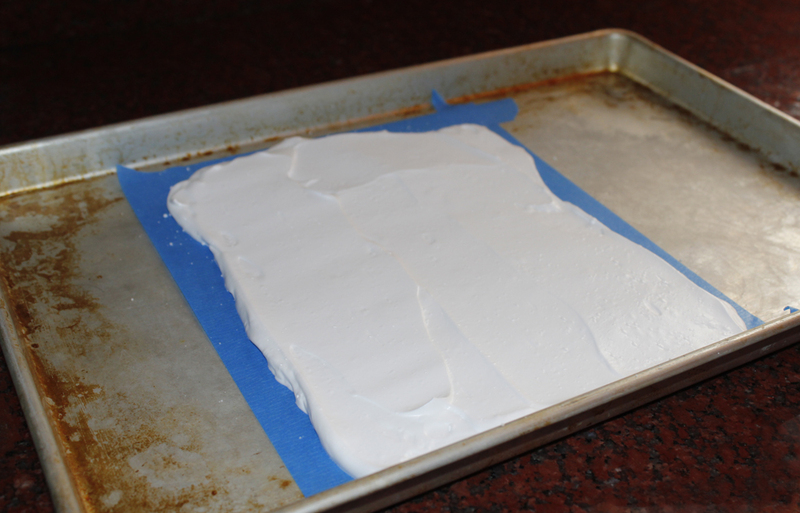 So, here it is: the cheap and easy method for marbleizing paper. Not pictured: the color! That’s because there are so many different things you could use. See list below for ideas. *Shaving Cream–the foamy kind. I picked the cheapest kind I could find at CVS. *Two jelly roll pans (the cookie sheet-sized pans with an edge all of the way around). Nine-by-thirteen pans will do, though I find the taller sides awkward. Obviously, you need to put another piece of duct tape on top. You may want to include something like a chopstick or a narrow piece of cardboard so the comb stays in a flat shape. *Twine and clothespins, or whatever you need for the papers to dry without getting dye or paint everywhere. You could use cooling racks, hangers and paper clips, or even old newspapers spread on the floor. *Your coloring medium of choice. 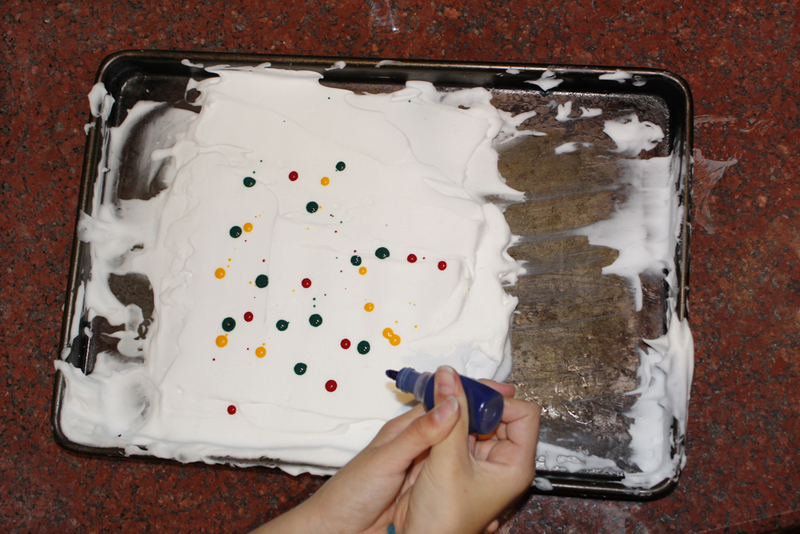 Cheapest and easiest to find is food coloring. 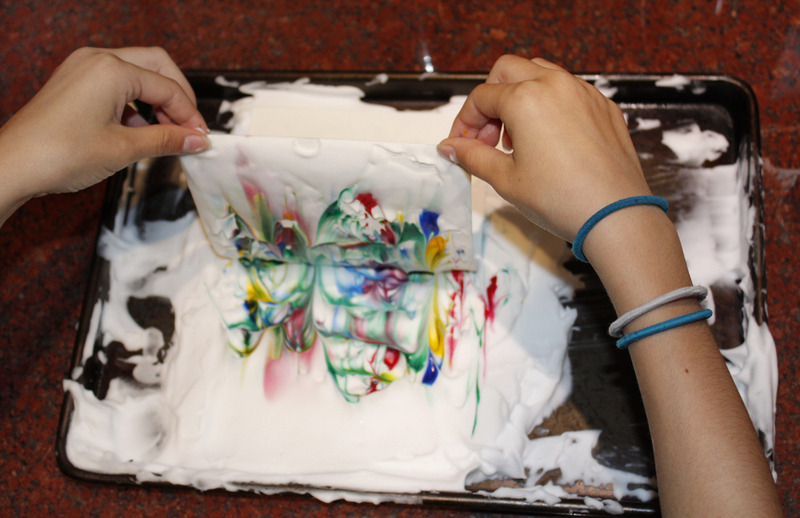 Other options: acrylic paint, tempera paint, or the dyes that come in the marbling kit. Demonstrated below is the food coloring technique. Tips and modifications necessary for the other media will follow. 1. Cut your paper to the shape and size you want. 2. 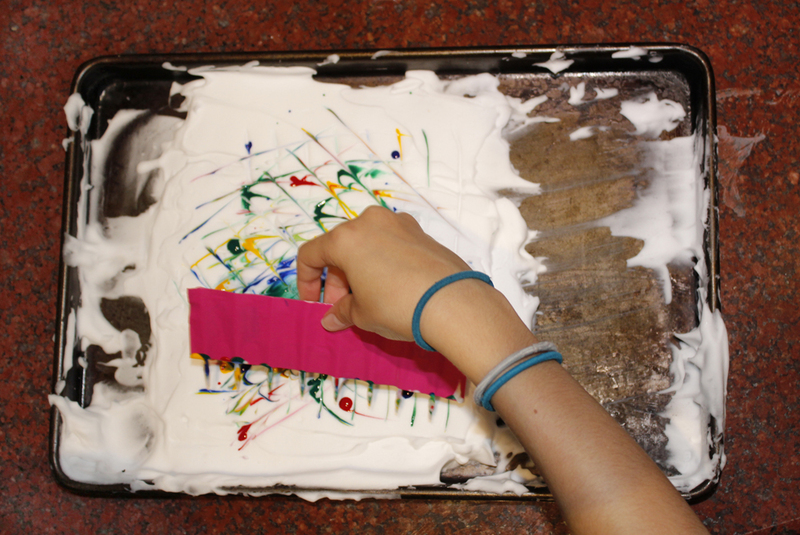 Use tape to outline the size of the paper in a jelly roll pan. This helps you to plan and create your pattern. It also helps keep kids from spraying egregious quantities of shaving cream everywhere. No guarantees, though. 3. Fill the area with shaving foam. 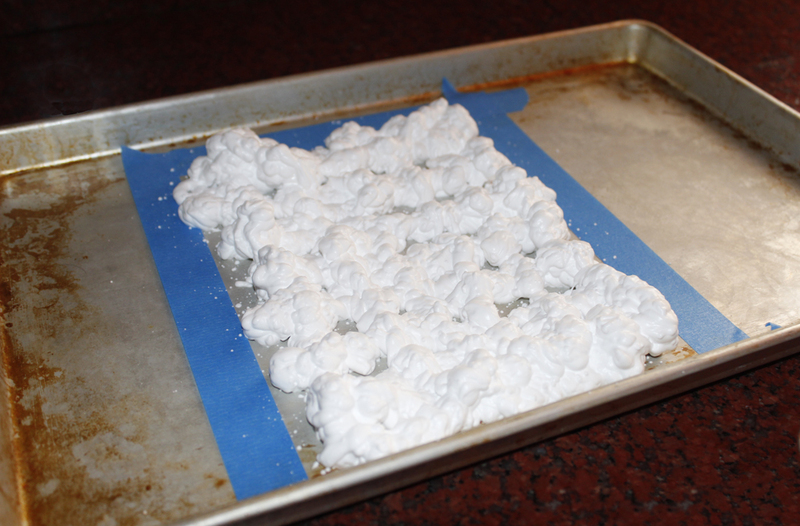 I would have used more–an inch thick is best-except that my kids had used up most of the shaving cream during the experimentation phase. See #2. 4. Use your tool of choice to smooth the shaving cream. 5. Dot food coloring over your shaving cream. You could sprinkle pell mell, or in a pattern. 6. 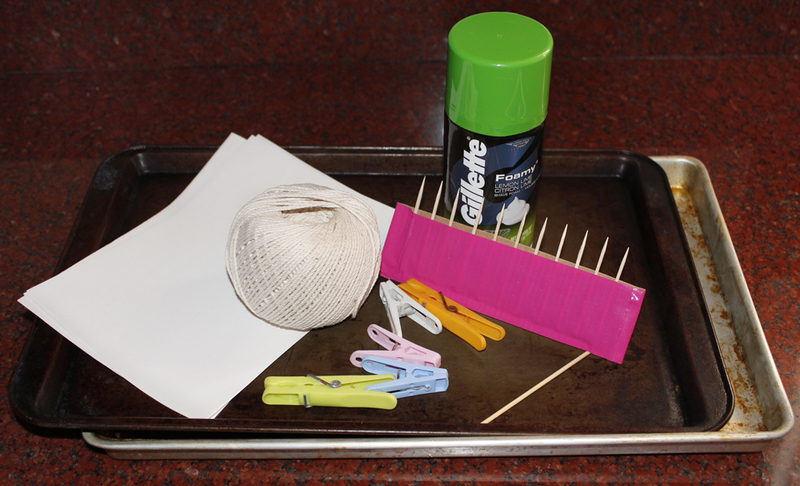 Use the comb or toothpicks to make your design. Keep in mind that you want to keep the color on top of the foam, so it will make contact with the paper and make a print. 7. Gently set your paper on top of the foam, trying not to move it around. 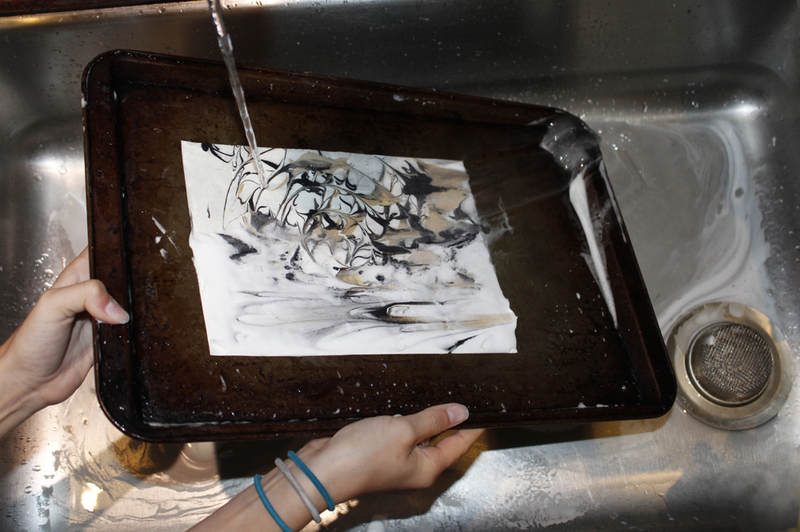 Use your hand to lightly press the paper into the dye, to get rid of any air pockets and ensure the paper touches the color. I leave it for a few seconds for good luck. 8. 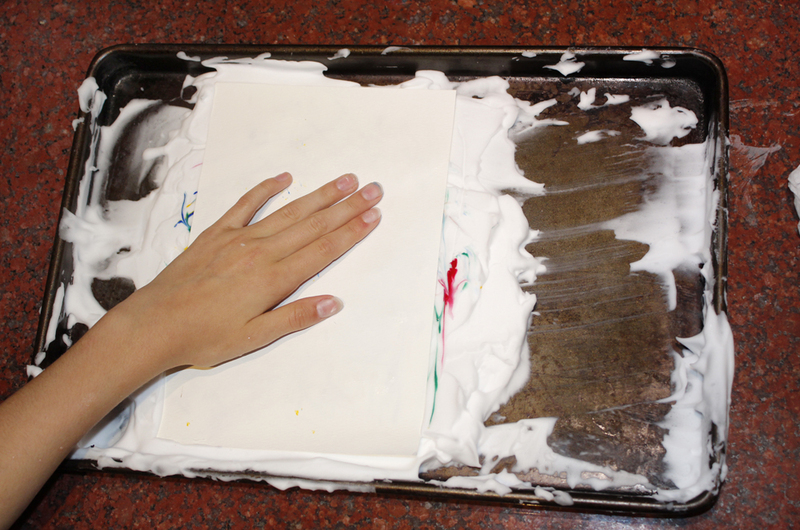 Carefully peel the paper off of the foam, and set it face up in the clean pan. 9. Use a scraper or other flat tool to gently brush the residual shaving foam from the paper, leaving the design behind. 10. Allow to dry thoroughly. Here is a food coloring print. If you look carefully, you can see where I dripped water on it accidentally. Don’t do that. Tempera paint: If you are using tempera paints, thin them and use a paintbrush to carefully paint them on top of the shaving foam. It was especially gratifying to use tempera because I could slather on a goodly amount of pigment and leave very little white paper remaining. Also, there are a lot more colors from which to choose. You can mix food colors, but you never get an awesome purple or magenta that way. 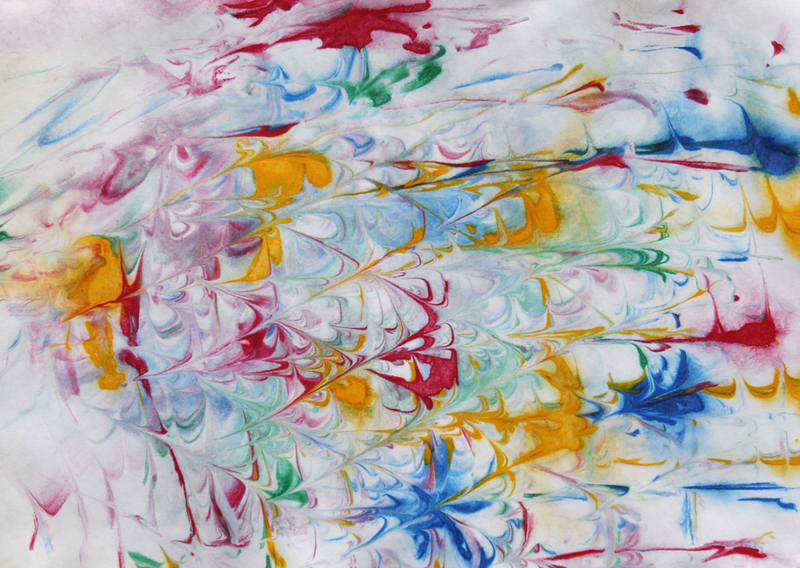 The left side shows how I painted and dripped tempera onto the shaving cream. The right shows the patterns I made with a toothpick. 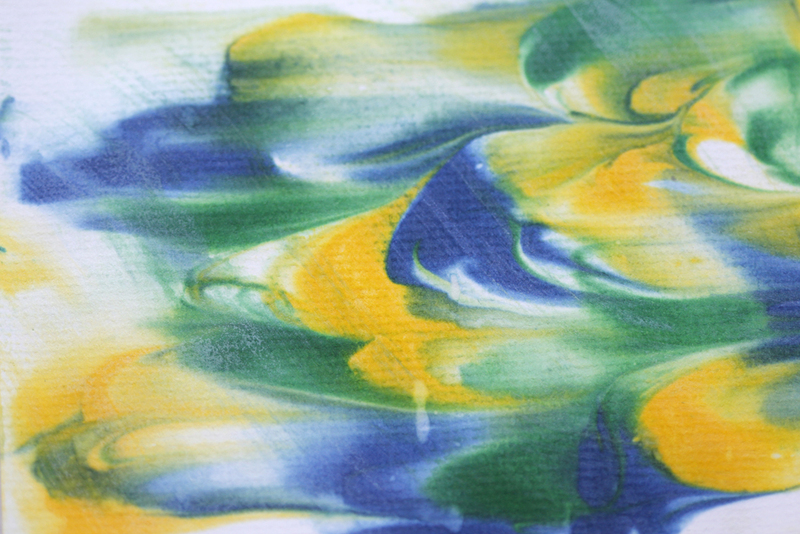 A print made with marbling dyes. 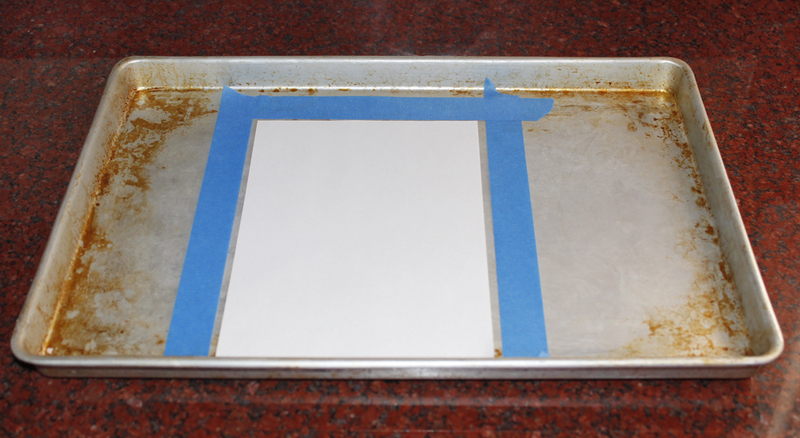 If you decide to go this route, you may want to add an extra step: put the print face up on a clean jelly roll pan and rinse it under running water. Then your print will be more archival. Plus, it will no longer smell like a manly man. I did not opt for the pricey acrylics. 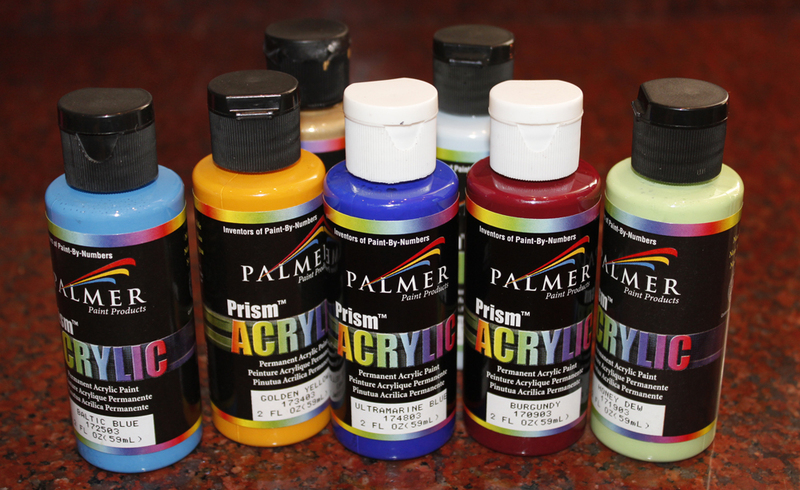 You can often find the Palmer acrylics pictured below in the kids’ area of the art store, rather than the accomplished adult painter side. My next plan is to marbleize blank postcards. I was going to send one to my mother for Mothers’ Day, but it looks like I missed the boat. Maybe next year. That’s all. Please let me know if you have any comments, questions, or suggestions. Really great lesson. I recently learned hoe to make alcohol inks and want to try them with marbleing. I’ve also heard/read you can use laundry starch in place of the shaving cream for more archival results. Thanks so much for making this accessible for those who DON’T want to order sizing, alum and migrants from Dharma. I’d love to find out how to make alcohol inks. Those would certainly be more permanent than either food coloring or tempera paints. And thanks for the tip regarding laundry starch. I’ll have to try it! Next Next post: Ice Cream in a Bag!